Foreign Affairs Ministers of Ethiopia and Sudan have met with former South Sudanese First Vice President Riek Machar. 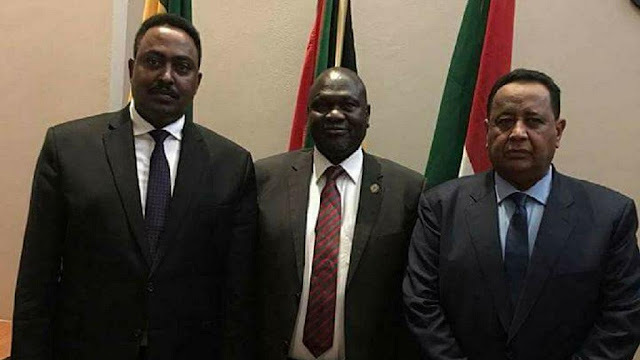 Ethiopia’s Workneh Gebeyehu and Sudan’s Ibrahim Ghandour met with Machar in South Africa as part of efforts by the Intergovernmental Authority on Development (IGAD) to maintain peace in South Sudan. Machar, who leads the Sudan Peoples Liberation Movement – In Opposition (SPLM – IO) has been in exile in South Africa since renewed clashes between his forces and those of the government erupted earlier this year. Reports last month indicated that Machar and other opposition elements had responded positively to a national dialogue body constituted by President Salva Kiir. Machar’s forces have battled soldiers loyal to Kiir for more than three years. The country plunged into civil war just two years after independence from Sudan in 2011 after President Salva Kiir fired his then deputy Riek Machar. The East African regional bloc, IGAD, at its 2017 Extra-Ordinary Summit in Ethiopia’s capital Addis Ababa called upon both parties to return to the 2015 peace agreement whose implementation was abandoned following renewed violence. The agreement faltered after renewed conflicts in 2016 between the two parties. Kiir declared ceasefire and launched the national dialogue body to organise the national peace dialogue expected to include the armed opposition to address the root causes of the conflict.